According to a 2012 GFK MRI study, 70% of tablet owners say they want to buy items in digital magazines by clicking on an ad. T-ZINE MEDIA’s e-commerce platform is designed to do just that, exciting readers and prompting them to interact by performing one-touch purchases from any ad without ever leaving the publication. Bringing rich brand experiences to readers and a better way for marketers to interact and engage with our readers creates a new marketing opportunity. Never before has there been a more explosive mix of compelling editorial, advertising and financial opportunities rolled into one publishing model. 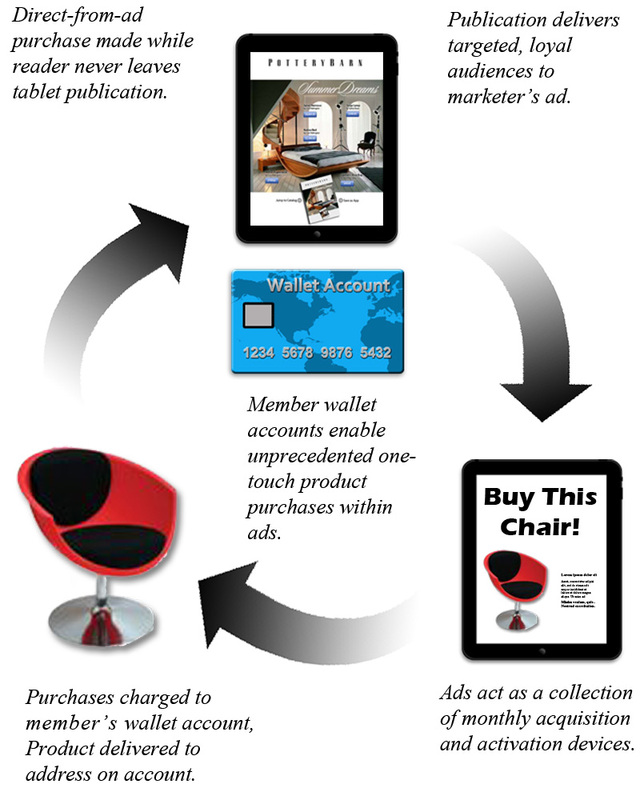 Our content streams wirelessly onto the tablet platform; full-page, ads dazzle with a mix of mobile-tech functionality and unprecedented one-touch purchases, and the whole thing feeds into a brilliant new model anchored by a member’s wallet account. So, what’s a member wallet account? An account is established by a member when they enter their name, address and credit card to cover a small monthly fee charged for their monthly membership to one of T-ZINE MEDIA digital publications. This revolutionary, powerful new member wallet account will feed an entirely new kind of commerce directly from ads in each monthly issue. It provides an amazing new opportunity for consumers to enjoy reading about their favorite subjects and participating in their favorite causes, while saving on every purchase made directly from one of T-ZINE MEDIA’s digital tablet publications. 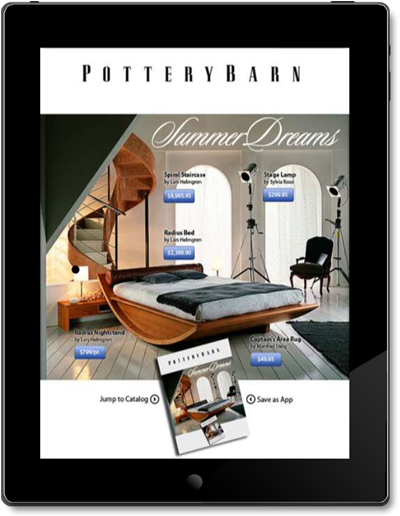 This simulated Pottery Barn ad displays how one-touch purchases are made without leaving publication through capabilities of T-ZINE MEDIA’s e-commerce platform. The ad displays items and pricing that can be purchased immediately by simply clicking price button. Links are also added, allowing members to save the catalog as a separate app or go directly to the merchant’s catalog or website.